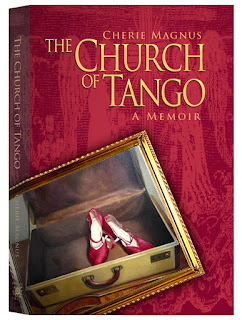 Cherie has been an inspiration for me from the time I started tango (and my tango blog) over three years ago. She has been the voice of encouragement and wisdom and now, after reading her memoir, I have a sense of why that is. Her book is not a "tango book" per se (at least now how we normally think of them) - it is really a memoir of the life that brought her to tango. It is a taste of how tango (and dance in general) changed her life. In fact if I have one complaint, and really it's not a complaint as much as a meek request for a sequel, it would be that her book ended too soon. (Una tanda mas, Cherie!) I wanted to know more about her tango life, though much of those thoughts, experiences, pieces of tango wisdom, can be found on her fantastic blog - http://tangocherie.blogspot.com/. "We must let go of the life we have planned, so as to accept the life that is waiting for us." Many tango memoirs start with a broken heart, an affair gone badly - but to lose one's husband, to find yourself facing a life on your own when your identity has been so tied to your spouse, that is another journey altogether. For me, it is the scariest thing I can imagine - but that's only the beginning of her story. Cherie struggles through so much and yet has so many triumphs. This isn't a romantic tale of running away and having adventures to distract one's self from life's difficulties - but more a chronicle of a soul finding its home. To borrow something that Pema Chodron wrote - Cherie's story is one of leaning into the sharp points. It is, in places, heart-breakingly difficult to read. I couldn't read it at work for fear of having to explain my swollen eyes and red nose. It's worth the struggle to follow her path - her writing makes it impossible not to keep reading. For me, her writing mirrors how I think of tango - honest, human, vulnerable. I recommend Cherie's book so highly (as well as her blog linked above.) It's a very personal, very moving book that, like Cherie, has much wisdom, inspiration and encouragement to impart.